Holiness is the opposite of sin, therefore what is the true bible definition of sin? I John 3:4 - Whosoever committeth sin transgresseth also the law: for sin is the transgression of the law. This law is the law of Christ. John 12:48 - He that rejecteth me, and receiveth not my words, hath one that judgeth him: the word that I have spoken, the same shall judge him in the last day. 1. Sin is a willful transgression. John 9:41 - Jesus said unto them, If ye were blind, ye should have no sin: but now ye say, We see; therefore your sin remaineth. James 4:17 - Therefore to him that knoweth to do good, and doethit not, to him it is sin. 2. Sin is not a mistake and a mistake is not sin. Matthew 5:28 (Sin) - But I say unto you, That whosoever looketh on a woman to lust after her hath committed adultery with her already in his heart. Acts 23:2-5 (Mistake in judgment) - And the high priest Ananias commanded them that stood by him to smite him on the mouth. Then said Paul unto him, God shall smite thee, thou whited wall: for sittest thou to judge me after the law, and commandest me to be smitten contrary to the law? And they that stood by said, Revilest thou God's high priest? Then said Paul, I wist not, brethren, that he was the high priest: for it is written, Thou shalt not speak evil of the ruler of thy people. All mankind born into this world are under the power and dominion of sin. Man can be saved from sin and live a holy life. Jesus Christ came for the very purpose of saving man from sin. When man sins he cuts himself off from fellowship with Christ. I John 3:6 - Whosoever abideth in him sinneth not: whosoever sinneth hath not seen him, neither known him. Isaiah 59:2 -But your iniquities have separated between you and your God, and your sins have hid his face from you, that he will not hear. John 9:31 - Now we know that God heareth not sinners: but if any man be a worshipper of God, and doeth his will, him he heareth. Exodus 32:31-33 - And Moses returned unto the LORD, and said, Oh, this people have sinned a great sin, and have made them gods of gold. Yet now, if thou wilt forgive their sin--; and if not, blot me, I pray thee, out of thy book which thou hast written. And the LORD said unto Moses, Whosoever hath sinned against me, him will I blot out of my book. Christ taught that we need not sin. John 8:34-36 - Jesus answered them, Verily, verily, I say unto you, Whosoever committeth sin is the servant of sin. And the servant abideth not in the house for ever: but the Son abideth ever. If the Son therefore shall make you free, ye shall be free indeed. John 8:3-11 - And the scribes and Pharisees brought unto him a woman taken in adultery; and when they had set her in the midst, They say unto him, Master, this woman was taken in adultery, in the very act. Now Moses in the law commanded us, that such should be stoned: but what sayest thou? This they said, tempting him, that they might have to accuse him. But Jesus stooped down, and with his finger wrote on the ground, as though he heard them not. So when they continued asking him, he lifted up himself, and said unto them, He that is without sin among you, let him first cast a stone at her. And again he stooped down, and wrote on the ground. And they which heardit, being convicted by their own conscience, went out one by one, beginning at the eldest, even unto the last: and Jesus was left alone, and the woman standing in the midst. When Jesus had lifted up himself, and saw none but the woman, he said unto her, Woman, where are those thine accusers? hath no man condemned thee? She said, No man, Lord. And Jesus said unto her, Neither do I condemn thee: go, and sin no more. John 5:14 - Afterward Jesus findeth him in the temple, and said unto him, Behold, thou art made whole: sin no more, lest a worse thing come unto thee. Peter taught freedom from sin. Paul taught that a Christian lives free from sin. John was strong in his denunciation of sin. I John 3:5-10 - And ye know that he was manifested to take away our sins; and in him is no sin. Whosoever abideth in him sinneth not: whosoever sinneth hath not seen him, neither known him. Little children, let no man deceive you: he that doeth righteousness is righteous, even as he is righteous. He that committeth sin is of the devil; for the devil sinneth from the beginning. For this purpose the Son of God was manifested, that he might destroy the works of the devil. Whosoever is born of God doth not commit sin; for his seed remaineth in him: and he cannot sin, because he is born of God. In this the children of God are manifest, and the children of the devil: whosoever doeth not righteousness is not of God, neither he that loveth not his brother. Misinterpreted scriptural objections to a sinless life. Romans 7:18-24 are used to defend the "sin you must" doctrine. 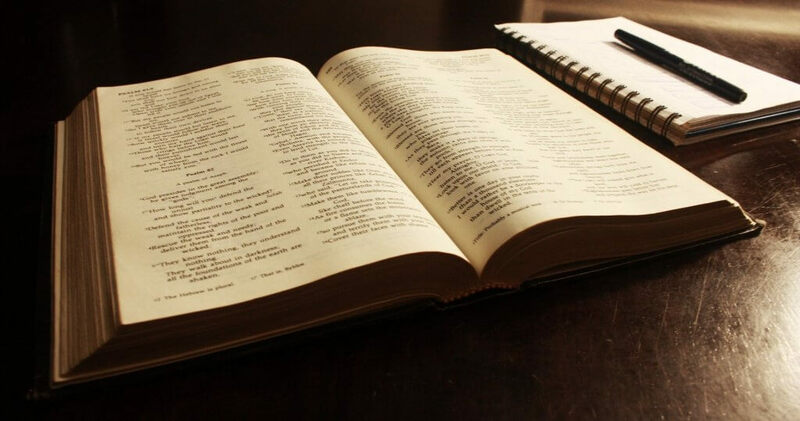 A thorough study of this entire chapter reveals Paul’s introduction to the knowledge of the law and his experience as a religious man under the law of the mases. The Mosaic Law did not provide deliverance from sin. But redemption through Christ did deliver Paul from the power and dominion of sin. Romans 8:1-4 - There is therefore now no condemnation to them which are in Christ Jesus, who walk not after the flesh, but after the Spirit. For the law of the Spirit of life in Christ Jesus hath made me free from the law of sin and death. For what the law could not do, in that it was weak through the flesh, God sending his own Son in the likeness of sinful flesh, and for sin, condemned sin in the flesh: That the righteousness of the law might be fulfilled in us, who walk not after the flesh, but after the Spirit. The first experience is that of Saul of Tarsus, the second experience is that of the Apostle Paul. The world and sin are all about us. John 17:14-16 - I have given them thy word; and the world hath hated them, because they are not of the world, even as I am not of the world. I pray not that thou shouldest take them out of the world, but that thou shouldest keep them from the evil. They are not of the world, even as I am not of the world. What is the world? John defines it. I John 2:15-17 - Love not the world, neither the things that are in the world. If any man love the world, the love of the Father is not in him. For all that is in the world, the lust of the flesh, and the lust of the eyes, and the pride of life, is not of the Father, but is of the world. And the world passeth away, and the lust thereof: but he that doeth the will of God abideth for ever. This word lust means a longing, a craving, and an eagerness to enjoy. It means delight, pleasure, or desire. Any pleasure, delight, desire, or interest that draws us away from God, or makes us forget God, or places God in second place is 'Worldliness'. Matthew 16:24-26 - Then said Jesus unto his disciples, If any man will come after me, let him deny himself, and take up his cross, and follow me. For whosoever will save his life shall lose it: and whosoever will lose his life for my sake shall find it. For what is a man profited, if he shall gain the whole world, and lose his own soul? or what shall a man give in exchange for his soul? James 4:4 - Ye adulterers and adulteresses, know ye not that the friendship of the world is enmity with God? whosoever therefore will be a friend of the world is the enemy of God. As children of God we do not desire to act, talk, look like, or have the attitudes of the unsaved world. II Corinthians 5:17 - Therefore if any man be in Christ, he is a new creature: old things are passed away; behold, all things are become new. As children of God living in this sinful world we must be on guard lest our mind, our thoughts, our attitudes begin to conform to the world. A holy life includes the practice of stewardship. A steward is a person who has been put in charge of another’s property. I Corinthians 4:2 - Moreover it is required in stewards, that a man be found faithful. Man’s salvation was purchased at a great price. Therefore, man nor his possessions, in reality, belong to him. I Corinthians 6:19-20 - What? know ye not that your body is the temple of the Holy Ghost which is in you, which ye have of God, and ye are not your own? For ye are bought with a price: therefore glorify God in your body, and in your spirit, which are God's. Psalms 50:10 - For every beast of the forest is mine, and the cattle upon a thousand hills. I Corinthians 4:7 - For who maketh thee to differ from another? and what hast thou that thou didst not receive? now if thou didst receive it, why dost thou glory, as if thou hadst not received it? As stewards of God we must give account of that which God has entrusted us with. Matthew 25:14-30 - For the kingdom of heaven is as a man travelling into a far country, who called his own servants, and delivered unto them his goods. And unto one he gave five talents, to another two, and to another one; to every man according to his several ability; and straightway took his journey. Then he that had received the five talents went and traded with the same, and madethem other five talents. And likewise he that had received two, he also gained other two. But he that had received one went and digged in the earth, and hid his lord's money. After a long time the lord of those servants cometh, and reckoneth with them. And so he that had received five talents came and brought other five talents, saying, Lord, thou deliveredst unto me five talents: behold, I have gained beside them five talents more. His lord said unto him, Well done, thou good and faithful servant: thou hast been faithful over a few things, I will make thee ruler over many things: enter thou into the joy of thy lord. He also that had received two talents came and said, Lord, thou deliveredst unto me two talents: behold, I have gained two other talents beside them. His lord said unto him, Well done, good and faithful servant; thou hast been faithful over a few things, I will make thee ruler over many things: enter thou into the joy of thy lord. Then he which had received the one talent came and said, Lord, I knew thee that thou art an hard man, reaping where thou hast not sown, and gathering where thou hast not strawed: And I was afraid, and went and hid thy talent in the earth: lo, there thou hast that is thine. His lord answered and said unto him, Thou wicked and slothful servant, thou knewest that I reap where I sowed not, and gather where I have not strawed: Thou oughtest therefore to have put my money to the exchangers, and then at my coming I should have received mine own with usury. Take therefore the talent from him, and give it unto him which hath ten talents. For unto every one that hath shall be given, and he shall have abundance: but from him that hath not shall be taken away even that which he hath. And cast ye the unprofitable servant into outer darkness: there shall be weeping and gnashing of teeth. Everything we are or have belongs to God - our time, talents, possessions, money. All of these must be fully consecrated to God to be used as he sees fit. This is but reasonable service. Romans 12:1 - I beseech you therefore, brethren, by the mercies of God, that ye present your bodies a living sacrifice, holy, acceptable unto God, which isyour reasonable service.